I managed to drop into King (or is it Kings? 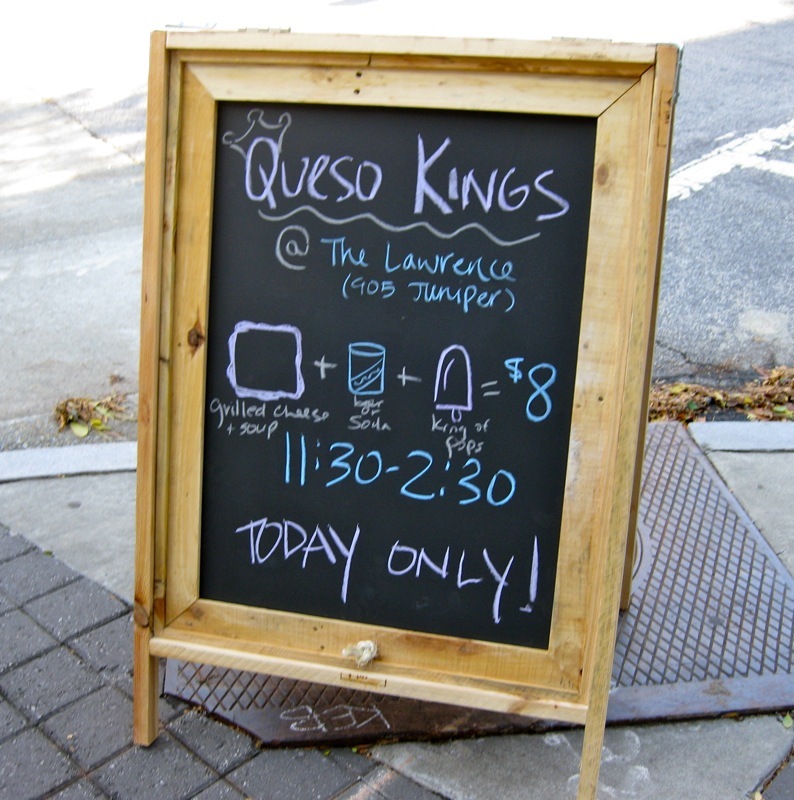 I swear they're cloning tall blonde dudes with aviators) of Pop's new pop up, Queso King today. 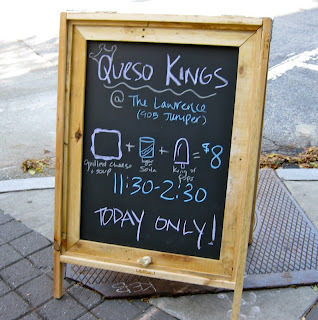 They're setup on Wednesdays and Thursdays at the Lawrence during lunch hours and seem to have a new cheese based concept each week - this week grilled cheese and soup, while last week was quesadillas and salad. 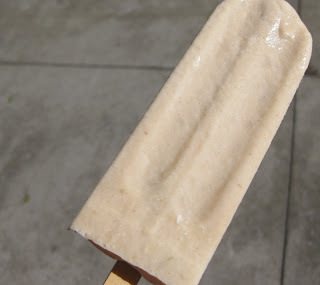 It's hard to beat the deal as it's a choice of sandwich, soup, drink (including Miller High Life) and popsicle for $8. They post their menu on Facebook shortly before opening. The food was pretty darned good - all the bread is from H&F and everything appears to be scratch made. The turkey on my Grilled Thanksgiving (brie, turkey, cranberry, sweet potato) was off the frame (and chain) and completely tender and delectable. The only unfortunate part of the sandwich was that the King went overboard with the cranberry which entirely masked all of the other ingredients on the sandwich. I happen to like cranberry, so it wasn't offensive, but I wish I could have tasted more of the individual components. The soup, while not transcendent, was also very good. Again, it's hard to beat this deal from one of Atlanta's local street-food mavens. 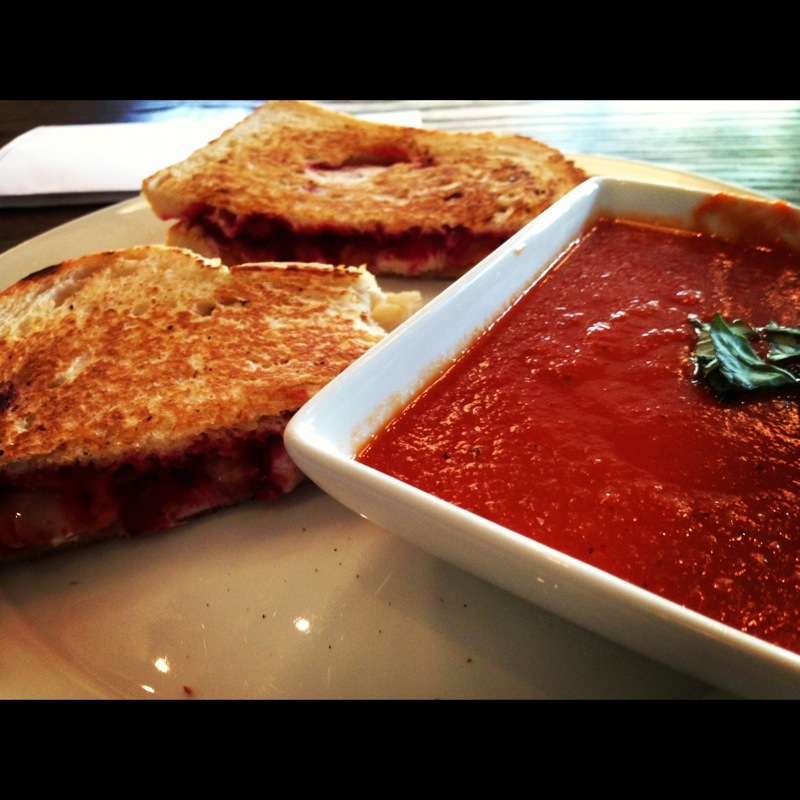 Give it a try on Thursdays and see for yourself.